Mondays aren’t all bad, you know. I mean, if you had this burger to look forward to after your first day back, it might make Monday your new favourite day of the week. Ok, probably not. But, let me just say one thing: This burger needs to be a part of your life as soon as possible! 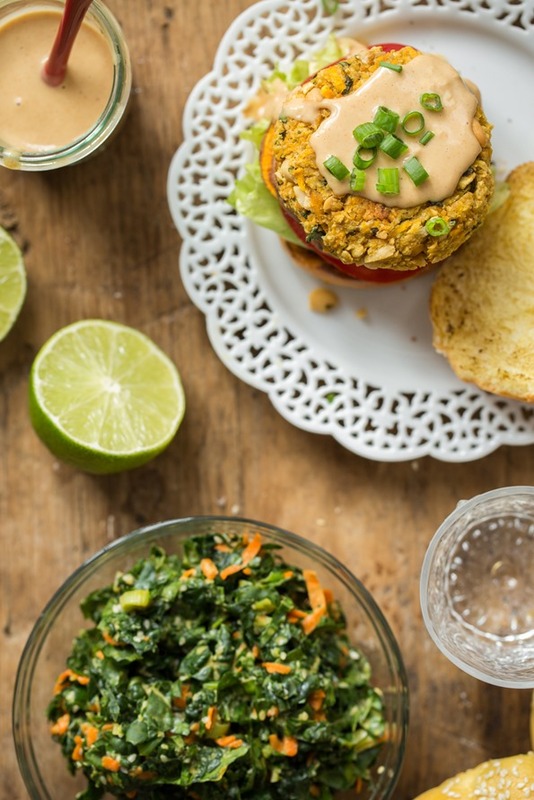 These Thai-inspired veggie burgers are made with a base of shredded sweet potato and chickpeas and are flavoured with fresh ginger, garlic, cilantro, basil, and a sprinkle of lime juice and toasted sesame oil. Oh my lanta! If that weren’t enough, salted, roasted chopped peanuts are stirred into the mix to give these burgers a wicked nutty crunch that’s just downright hard to resist. Even the uncooked batter is delicious in its own right! I stacked the baked golden patties with roasted sweet potato rounds (if we’re roasting, we might as well roast the leftover sweet potato! ), fresh tomato and lettuce, and then drizzled it with some of my favourite spicy peanut sauce. Even Eric, the peanut butter hater, loves these burgers – peanut sauce and all. I don’t know whether to be happy or sad. The peanut sauce makes a good amount, so I made a simple shredded kale salad to serve on the side. I added a shredded carrot and a few green onions into the finely chopped kale. A nice little side salad! The sauce is good on pretty much everything from salads to wraps to roasted veggies and noodle bowls. You can also make this sauce with almond butter or even sunflower seed butter for a nut-free version (adjusting other ingredients to taste, of course). See my tips in the recipe below on how to make this recipe nut and soy free. I’ve got you covered. Monday you never looked so good. Let’s live it up! 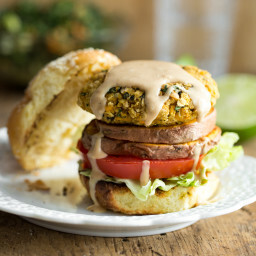 Bursting with flavour, these Thai-inspired veggie burgers will make your every dream come true! 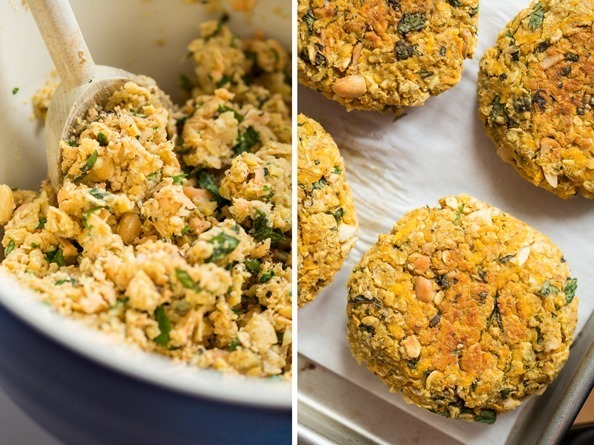 The patties are made with a base of shredded sweet potato and chickpeas and are flavoured with fresh garlic, ginger, cilantro, basil, and a sprinkle of lime juice and sesame seed oil. To add some delicious crunchy texture, I've mixed in some chopped roasted and salted peanuts into the mix. These burgers are naturally gluten-free and you can make them soy-free by using coconut aminos instead of the tamari (or simply omit the tamari all together). See my note below on making this recipe nut-free. Peanut sauce is adapted from my Almond Butter Sauce. Notes: 1) To make the burgers soy-free, use coconut aminos in place of the tamari or simply omit it all together. 2) To make this recipe nut-free, omit the peanuts in the burgers and use sunflower seeds instead. 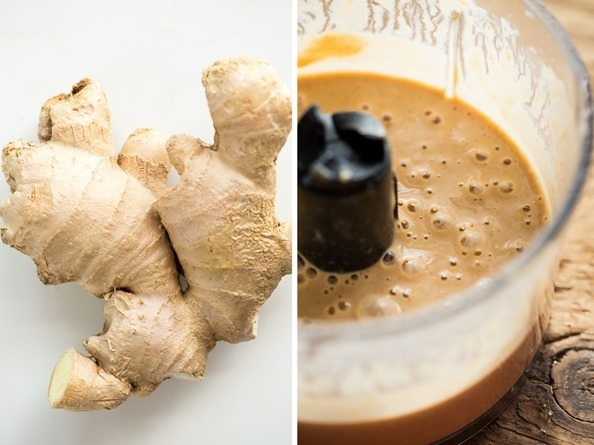 For the peanut sauce, you can probably use sunflower seed butter instead of the peanut butter, but you will likely have to adjust the other ingredients to taste since its more bitter than peanut butter. I’m going to start carb loading for my first marathon next week and was planning to incorporate as many sweet potatoes as possible. This is perfect! I love making thai peanut sauce with PB2. I love your previous veggie burgers and this sauce looks amazing. Thanks Angela for yet another amazing recipe. I loooove the look of this! Awesome! These look DELICIOUS! I’m going to make them…. we just harvested a whole lot of sweet potatoes from our garden yesterday! 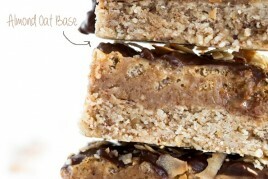 I love that my favorite thing, crunchy chickpeas, are included in these…genius! Oh man those look good and I bet that peanut sauce would make an awesome salad dressing too especially with something with a little bite like arugula! Oh wow, these look amazing! I made some peanut sauce yesterday to drizzle on roasted broccoli and I was eating it by the spoonful, looks like these burgers might need to come up on the list soon! 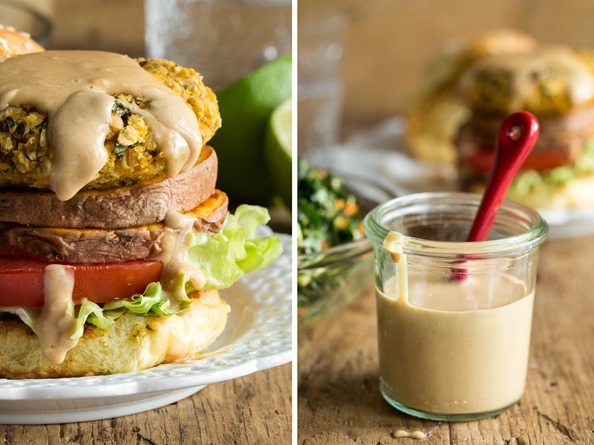 Not sure I can persuade the hubby to try the sweet potato burgers, but the peanut sauce looks to be a winner! Your wonderful posts bring the biggest smile to my face! Your recipes always look and taste divine! I can’t wait to make these burgers!! Ok, so I’m drooling as I type this: I love sweet potatoes. I love all things Thai. I could happily drown in peanut sauce. So, as you can imagine, Thai sweet potato veggie burgers with peanut sauce is, like, basically the holy grail for my taste buds. Weekly menu, we have a new front-runner! recipes.. At the moment cool down granola nuts..! This looks delicious! 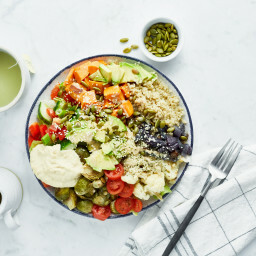 I ordered the Buddha Bowl from Fresh last night and the spicy peanut butter sauce is my favorite. I can’t wait to try this recipe because I think it will be similar, yummmm. That is a great idea. Kebabs, even! Peanut sauce on a veggie burger! THERE’S a great idea to get me out of my ketchup rut. The burgers look great, and are a good alternative to the Morningstar Farms patties- I am so done with those! I am wondering, though, do these patties freeze well? They should freeze fine – make sure to cool them after baking first. Sorry if this is a stupid question: Why do you have to bake them before freezing? 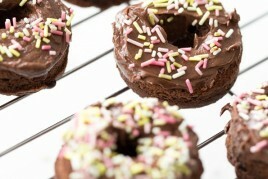 not a stupid question at all – baking them first seems to help them hold together better after thawing and cooking. Just a personal preference! And since it is a pretty meat & fish heavy menu I just introduced a falafel burger to the menu, and it is selling like hotcakes. I wanted to mention that after researching falafel I found that you can used soaked chickpeas for the mix ( you DONT need to cook them!) and it works great. You can pan fry and then bake in the oven, or deep fry – if you have the guts to do that in your house haha. My ratio is 6 cups soaked chickpeas, one large onion diced, 1 bunch green onion and whatever spices you want to add + 2 TBSP ALL PURPOSE FLOUR which I am trying to eventually omit so I can offer them as a gluten free option. Any ideas of a flour I could use instead? I suppose chickpea flour? Anyway wanted to mention the soaked chickpeas could work for your recipe too since I know we all have a bag of dried chickpeas and never get around to cooking them! Thanks for your blog I love it so much. It inspires me every day. Thanks for your comment! Glad to hear you are serving up a meat-free option on the menu. I’ve always wanted to try the soaked/no cook chickpea method in falafel, but wondered if the chickpeas would be harder to digest? Have you noticed any tummy issues? I know soaking helps a lot, but I wonder how I would digest them without the extra cooking time too. How long do you soak for? Anyway, let me know if you try it out with this recipe! As for the flour, you can usually swap AP flour for AP gluten-free flour (I like Cuisine Soleil brand and it’s Canadian too) just fine. Hi Angela! Thanks for replying. Ok I’ll try gf flour. I always soak them atleast overnight, and I usually soak a big batch and just leave them in the fridge for when I need to whiz up at batch. I haven’t noticed any stomach issues! I have a vegetarian waitress who eats them all the time now and she hasn’t complained. I’ve eaten them myself too. No ill effects. I think the overnight soak plus “cooking” the burger is enough to cook the chickpeas.. I also found they were alot less wet and less willing to break apart than when I tried it with cooked ( and canned) chickpeas. Good to hear! Thanks for replying :) I’ll have to try it with my falafel recipe sometime! This recipe makes me look forward to Mondays! Thanks for sharing! The best part of these is definitely the peanut sauce! I love peanut sauce! What a fun flavor combo!!! These look so good! I definitely can’t wait to try them – I love anything Thai!!! I love the color of these burgers, Angela! 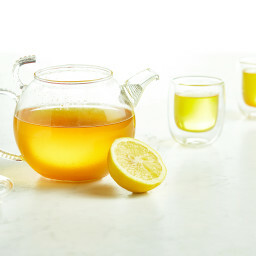 The yellow is so sunny and cheery, and I bet with the ginger, lime, coriander, all those great Thai flavors, they’re so good. And of course everything is better with peanut sauce! Pinned! Anything thai is soo good. Which makes me wonder why we don’t put peanuts, cilantro, lime, & ginger into everything we make ;)? Are you getting a little bit of a crust using just parchment? I’ve been on a VB tear lately and have tried a few different methods. parchment + olive oil (oil pools), alum foil + oil (alum foil tears), just olive oil on the baking sheet. Seems like oil + sheet gives a decent crust. The VB books I’ve been cooking from suggest pan frying first before baking but I skip that step….it’s a huge pain and takes too much time. These burgers look fabulous! I love the combination of chickpeas, sweet potatoes, and peanut sauce. Delish! Oh heck yes! My Monday just got a whole lot better! Thanks Angela! Oh these have everything going for them!! You want to have these in the freezer to go to at all times. I’m thinking of making them into balls as well as patties to use in a cashew creamy curry! Your photography is inspiring, by the way. Keep ’em coming! That peanut sauce looks a lot like one that we make and put on pretty much EVERYTHING. It’s so good! These burgers look awesome also, I’d been looking for a new veggie burger recipe to try, it might have to be these! Oh wow, these burgers look amazing! I love Thai everything and these burgers look like the perfect monday meal. Amazing! Definitely pinning to make this week! This is amazing!! I have to try this one! I was just trying to figure out what I was making tomorrow to use up some of my sweet potatoes, and now I know! Thanks. This looks delicious. Amazing post, cannot wait to try these!! Question: I have oat flour on hand how much should I adjust the measurement by? You can sub in 3/4 cup oat flour. It’s usually the same measurement, so 3/4 cup rolled oats equals about 3/4 cup oat flour too. Makes it easy, right? Enjoy the burgers. This looks mind boggling yummy!! I can’t wait to try this!! Wow. Never mind I saw your reply to someone else. Thanks for sharing your recipe. I am looking forward to buying your book! I love all things peanut butter! These burgers look amazing and the sauce sounds addictive! Thanks so much for sharing! I love great food photography, as you can see. Aw thank you so much June, that means a lot to me! Looks wonderful! What kind of bread do you use – looks like a biscuit! Gorgeous, these are just gorgeous! Can’t wait to try these, and peanut butter is my current obsession. Wow, these look awesome! Difficult to say if you should be happy about Eric’s transformation – after all it means you’ll have to share peanut butter/sauce ;). Thank you for this. It’s on the menu for tomorrow. Happy Birthday to OSGMOM. It’s my Pops birthday today too! Side note: Angela it’s nice to know that I am not the only person with ‘belly’ issues. I have been practicing the fine art of ‘shallow breathing’ the last few days. Yikes… this attack is lasting forever. Can’t seem to nail the cause. Love this creative take on a veggie burger! Sweet potato and Thai flavors? Umm that sounds like heaven! I love homemade veggie burgers and this is such a fun take! These burgers sound completely amazing! Seeing that I have all of the ingredients on hand, I can’t think of any reason not to make them tomorrow! Your photographs are absolutely beautiful, Angela. This is such a treat for the eyes. This might be my new favourite burger. And I haven’t even made it yet! Hi – wondering if there is something I can substitute for the chic peas? We can’t eat legumes (and will skip the peanuts for cashews or almonds). Is there something else I can use in place of the chic peas? All legumes (anything that grows in a pod) is out. I’m sorry I don’t know of anything you can sub for the beans. 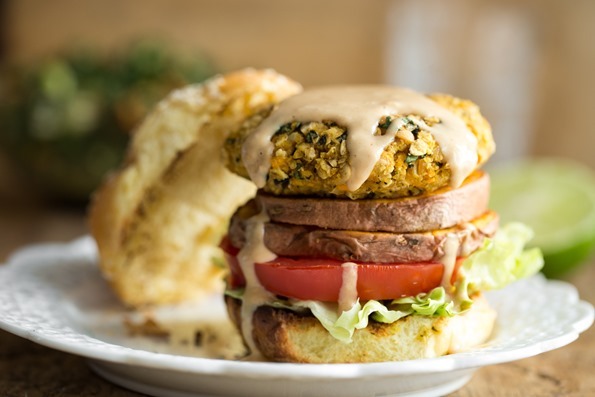 I was just at Fresh restaurant over the weekend and my friend ordered the Thai veggie burger with peanut sauce – and I was so jealous that I couldn’t have it because of my allergies! I can’t wait to try this one out with sunflower seeds and sunflower seed butter. I bet it will be amazing! These veggie burgers look marvelous. Sweet potatoes are not really my thing, but I would love to try these. Hi Angela, Made these burgers last night and they were a hit. Love the peanut sauce idea for the burgers. We topped ours with avocado…..Yummy:) Appreciate your site soooo much. Not only did these burgers make our Monday better, the leftovers are going to make our Tuesday and Wednesday better too. My husband and I COULD NOT STOP eating and raving about them last night (and we are both looking forward to dinner tonight!) Thanks for bringing so much vegan deliciousness to our lives! These burgers were sooo good I loved them! Made them last night with cashews instead of peanuts and almond butter in the sauce instead of PB. Served them with an Udi’s GF bun with lettuce, tomato and cucumber. Loved that the base included 2 of my all time faves, chickpeas and sweet potatoes, and all those amazing aromatics of cilantro, basil, lime, sesame oil, garlic, and ginger made me really happy when I was throwing everything together! I made a double batch and am glad to have a nice stash in the freezer : ) The only thing I’ll change though for the next time around is to switch out the slightly heavy, brown nut sauce for a lighter, creamy green cilantro lime sauce, I feel that would better complement the heaviness of the burger and bring out those great aromatics a little more! I’m pretty sure you already have a recipe for the type of sauce I’m craving so I’m going to scan your archives for ideas! I really enjoy all your recipes, you are incredible for always churning out something new and amazing! Oh forgot I also pressed some black sesame seeds into the tops of the burgers before baking and they were just beautiful! I cannot wait to try these. I make and freeze a double batch of your “Perfect Veggie Burger” every few weeks. I am sure that these will be just as good! Does the sweet potato flavor really come through? I’m wondering about par-baking about half a cup of smallish cut up chunks to thicken up the texture? Any thoughts? I’m sorry- I meant par-boiling! Just a quick 4-5 minutes to soften up? Even though I’m reading this in the morning, I’m craving this delicious burger right now! I’ll try and hold off til dinner! Made these last night and they were amazing. The best part was that they are even better eaten as leftovers! I am going to make these in large batches to freeze. So yummy! Another home run on this recipe! I made it for dinner tonight, it was awesome!! Thanks. I was just wondering if you could use chia seeds in water as a replacement for the ground flax? I don’t have any flax at the moment, but I do have chia. Dear Angela, please omit the point 12 from the recipe (..the sauce will store in the fridge, the burgers can be frozen) as it is simply impossible to have any leftovers to store! Super yummy – and excellent winter food with all that ginger, garlic and sesame oil to keep us warm, happy and healthy. Thank you! I am so glad I found your blog! I made these veggie burgers tonight, and they were so delicious! I have a peanut allergy, so thank you for the suggestion on using sunflower seeds and sunflower butter instead. Turned out great! I just made these this evening for my non-vegetarian aunts, and they loved them! 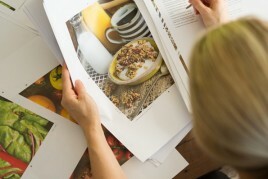 Tney’re looking forward to me making more recipes from your site! Ps: I’m anxiously awaiting your cookbook. I can’t wait! Hi Angela! Just wanted to say I made these burgers for lunches this week and they are absolutely delish! My husband and I aren’t vegan or even vegetarian, but I make many of your creations because they are so fresh and healthy. I preordered your cookbook on the weekend and I look forward to the many amazing recipes sure to be inside! Oh wow, these look super delicious. I haven’t really had much luck making burgers – the texture never comes out and they are always crumbly. But these sound so good, I have to try them! These look great and I would like to make them for a dinner party. I don’t have a food processor though, do you think I could just chopped the peanuts finely? And would using oat flour rather than processed rolled oats work the same, or would it be detrimental to the texture? Hey, Yes I think both of those modifications would still work. Let me know how it goes if you try it out! Made these over the weekend and they were fantastic and very flavorful and filling. Husband and mom both loved them. I topped them with a mango, red onion, tomato relish. It was a nice compliment to the thai peanut sauce. I also substituted almond butter for PB in the sauce and it turned out great. I froze 2 patties so I’m curious how they hold up. Thanks for another great recipe Angela! WOW! I made these last night and OMG! spot on seasoning, full flavour, stayed together, yum! Yum, making my second batch! Can’t wait for your cookbook! Hello. I just tasted thiese burgers! They are delicious, easy to do. 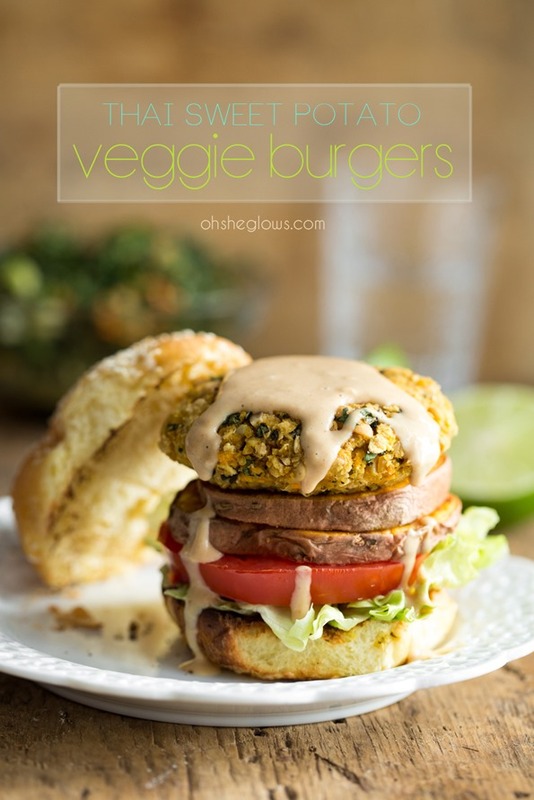 This is the best recipe of veggie burgers that I have made! The sauce is really tasty. I will try it with spring rolls. Thank you for this amazon recipe. I just made these for dinner. Oh. My. Goodness. Gracious! So delicious! Thanks for another amazing recipe. I made these tonight. 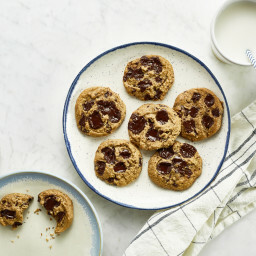 My husband took one bite and exclaimed “these go at the top of the list of things I want more often!” Clearly they were a big hit! I also made the side salad you suggested and it was tasty as well. Thanks for the great recipe! Wonderful recipe!!!! I exchanged chickpeas with brown rice (better for my tummy) and we put the burger’s on a salad of baby lettuces, red bell pepper, cilantro, mung beans and fresh avocado and drizzled the peanut sauce over the top. Yum!!! Made these for dinner last night! While it was a lot of prep (not good for a weeknight meal, save it for the weekends!) it was a winner winner! And the peanut sauce? Wow, yummy! I’m looking forward to the leftovers for my lunch! I think this recipe is going on my regular rotation for sure! I made this and it was amazing!!!! I cooked it for 3 non-veggie friends and they loved it. I love your recipes so much. I can’t wait for the cookbook. I appreciate that you get creative with true veggies and spices. It’s great how creative you can get without using soy products (meatless burgers, meatless taco meat, meatless chicken patties). You are making recipes that optimizes the nutrients in food! Thanks for being you. I’ve been following your blog almost since the beginning and have never left a comment, but Im about to break that silence. Im vegan, my two children are vegetarian, and I have an omnivore husband who look suspiciously at any and all “vegan food.” Never mind that we’ve been together 20+ years and my diet isn’t a new thing; he still eyes all meals I make with suspicion that there’s flax or spinach or somesuch in there (and he’s probably correct!). The mixture for these barely made it into patty form and into the oven (*licks fingers again*), but when they finally made it to the table, they were eaten my 6yo, 8yo and husband as if they were the last meal any of us may ever eat again. AMAZING. There was almost a fork stabbing incident over the last patty. So so excited to buy your book when it comes out here in NYC! P.S. every child who comes to my home clamors for “those cookie dough balls.” You’re a legend in our house. PS- LOL @ fork stabbing incident!! I made these last night and WOW! So YUM! I put a little too much lime juice in the sauce (oops) but it was still good. Great recipe! I made these the other night and they were amazing. Luckily I made a double batch because my boyfriend and his friend ate a batch themselves! I’ve been making recipes from your blog for 2 years now, and I’ve really enjoyed every recipe. Thanks for sharing! Can’t handle oats either, not even the gf kind. Can I use, oh, almond flour or something instead? From all this positive comments from those who’ve tried your VBs these are obviously yummy and I’m looking forward to trying them both as VBs and meatballs for HH. I am concerned about baking flax as it is so sensitive to heat and goes rancid quickly. Do you think they would still hold together without the flax? Made these for dinner last night, they were very tasty. I followed the recipe exactly except for the flax/water and substituted an egg. I’m a wondering if adding some soaked chia seeds would make them sick together a bit more. Recipe is a keeper, DH also said he’d like to have it again. Added an extra 1/8 tsp of Cayenne to the peanut sauce, next time I’ll add 3/4. We like food on the spicy side. My daughter sent me this recipe to make her when she comes home from college in a couple of weeks. I could not wait so tried them out tonight. Instead of a bun I served them on top of an arugela salad and roasted beets with ginger. They were delicious! Ijust tried this tonight for dinner. I put it in my homemade white wheat tortillas and filled it with tomato, lettuce, avacado, and jalapeno slices. It was SO delicious. I am not vegan, but have been trying to increase my intake of vegan meals and decrease my intake of dairy and meat. Thank you so much for all that you do! I want to try these but I hate cilantro. Is there something I can substitute? Parsley? I’m asssuming I can’t leave it out entirely? Yes you can leave it out if desired! Maybe sub with parsley like you suggested or even very finely chopped spinach too. enjoy! Thanks Angela! Spinach is a good idea! I wish I liked cilantro, but it just tastes like soap to me. Lol. These sound so good though I really want to try them. Thanks again! Did you know A genetic variant causes cilantro to taste like soap for about 10% of the population. Your one of them. Just made these burgers, and they were delicious! I like how well the ingredients held together. I topped them with the sauce, some chopped green onion, and orange slices! A nice lively touch! I would love to try these but I’m intolerant to oats – is there something else I could substitute? I made these for dinner. My husband (whose favorite meals usually consist of copious amounts of meat and oil) LOVED them! I topped with the sauce, grated carrot,grated beetroot, cucumber, tomato and lettuce. Was delicious and filling. I made these today and they were wonderful! I had to thin the peanut sauce out a little bit to make it spreadable. Also, adding the roasted sweet potato + veggies is a must. Thanks for another great recipe! The burgers were delicious! I think I have found that I’m not a huge peanut butter sauce fan, though. Is there another one of your sauces that you think would go nicely with these? Thanks! I just made this for dinner tonight – my husband and I loved it. I forgot I was out of flax seed so I used Ener G egg replacement and I served it on a bed of arugula, then quinoa and the burger. Fantastic! Thanks! Also, I early ordered your book and more excited than ever to get it. First of all, I love your site. So beautiful, and such great photos. 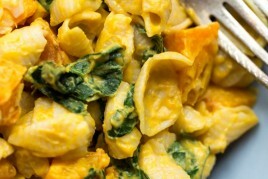 I would like to include a photo with a link to the recipe on your site. Just found your blog and Webb page. Exciting discovery! I have been a vegetarian for years. My eating plan is based on calaries and as a veggie I watch my protein intake. I’ve noticed that your recipes do not contain this information. Will your book? Do your other recipes have this listed? I ended up using roasted almonds because I realized today I only had them on hand and not peanuts. They are so delicious and really hold together well. I’ve been noodling around with veggie patties and just haven’t been able to nail the binder. These hold together perfectly! I made these burgers tonight and they tasted great! To be, or should I just cook longer (old oven) or at a higher temperature? I made these yesterday, my first ‘veggie’ burgers ever and was very impressed. Easy to make with lots of love and flavour the patties and sauce. I also loved the addition of roast sweet potato. Definitely one keeping this one bookmarked! Thanks again for another great recipe Angela. I just ordered your cookbook online, can’t wait to get it and try some more delicious recipes! A gorgeous looking veggie burger that looks like it would satisfy even a meat eater’s appetite. Thanks for sharing the recipe. I tried this recipe the other night and it was a resounding success. The burgers were divine and, miraculously (for me) held together perfectly. The Peanut Sauce is the best I’ve ever tasted! I did have a perplexing moment when I got home from the St Lawrence market and peeled my sweet potato. Instead of the yellow flesh I was expecting, this one was cream. For a moment I worried that I’d inadvertently bought the wrong thing, but a Google search assured me that there are a number of different kinds of sweet potatoes, one of which is white. One question though, what brand of chick peas comes in 15 oz cans? Every one that I can find is 19 oz. These were awesome! Another fantastic recipe from you! They were even delicious before they were baked! I made these 2 days prior and stored them in fridge, sealed tight. Were excellent. Another solid hit! The carnivore husband is more and more impressed with every recipe I make from your site. These freeze so well – I used Ezekiel sprouted grain burger buns, and then froze each patty plus one or two slices of sweet potato individually for a quick and easy lunch. I added red pepper slices and avocado as well – delicious! Ok, So VERY yummy. My voracious 15 year old son tried one and immediately loved them. He thought they were made with meat until he saw me eating one (as he was on his third burger) and said, “Oh, I guess these don’t have any meat in them.” The prep time was pretty long for me, so now I know what a hit these are, I’ll make a double batch next time and freeze the cooked patties. I can’t wait to make these for my carnivorous husband and for the next picnic event. Thanks for this gem! This looks amazing! Can’t wait to try it- you are so inspiring and I am so enjoying your book and checking out the wonderful and creative recipes on your site! Thank you and continued success! Hi Angela, Can I use something else in place of the chickpeas? For whatever reason, I have issues every time I eat chickpeas. Was wonder if I can use quinoa? and if so ..how much? Hi Angela, I just prepared these and can’t wait till tonight to cook them. I love Thai food although peanut sauce isn’t my favorite. Do you have any suggestions for a different sauce to serve with these veggie burgers? Oh.My.Word. I just made your Thai burgers and they are to die for! The flavors are perfect together and the peanut sauce is delish. I ate the burger without a bun, with the peanut sauce and sliced sweet potato and I was drooling. I love your blog, it truly inspires me as I make my way eating a more plant based diet. Thank you for being amazing! I just ordered your book and I can’t wait to get it. Is the sweet potatoe supposed to be baked before shredding??? These are amazing! I absolutely love this recipe as written. I usually make a batch and put the unused burgers in the freezer for a quick weeknight dinner later in the month. They freeze really well and the flavors are amazing. Slicing up and baking the remainder of the sweet potato and serving it on the burger definitely adds a little somethin’ to the flavors that I love. I highly suggest making a double batch of the peanut sauce, it’s so good that you’ll want to drink it in a glass! I made these tonight – I happened to have 6 cups of grated sweet potato so made a quadruple recipe! The prep time took much longer than anticipated (it was somewhere between 1.5 and 2 hours), which is certainly partially caused by the increased quantity of ingredients but I think it would have taken longer than 40 minutes for a single recipe when starting with all the ingredients unprepared. I used soy sauce instead of tamari sauce as that is what we had on hand and there are no dietary restrictions. I found that I needed to add a bit extra of the wet ingredients (soy sauce, lime juice, sesame oil) to get it to my taste. The result was delicious! 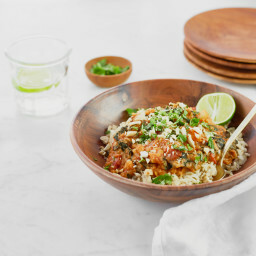 I love the depth of flavour with thai food and this recipe does a great job at that balance. It was also very filling. I am looking forward to freezing the extra burgers for future meals – it will be quite a treat! Thank you for this wonderful recipe! I made these and they are fantastic! I’ve never used flax as a binder and they held together very well. My recipe yielded 6 meal sized burgers, and they are great paired with a cucumber salad, avocado slices, and a sesame ginger dressing. The only thing I would change would be to add some jalapeno to the burgers because I love me some spice. Thanks for the great recipe! Thanks for this great recipe. Was exactly what I was expecting. Delicious and satisfying. Was concerned the burgers wouldn’t stick together, but as explained in the recipe, pressing them firmly together worked beautifully. I used cashews in the burgers instead of peanuts and this was perfect. Just made these today! I actually tripled the amount of sweet potato called for (grated in my food processor) and it still mixed up really well. I baked them on stoneware with some parchment paper just because I didnt’ feel like washing my stones :) Everything turned out great! I’m cooling a batch right now getting ready to freeze it. How many calories do you estimate each patty to have (I made 6 out of your recipe)? How many calories does the peanut sauce have? I made these yesterday. I didn’t have a box grater, so I just thinly sliced the sweet potato and then chopped it up a bit. It worked fine and it came out so amazingly fantastic! I’m really picky with veggie burgers and this one was amazing. The peanut sauce came out a bit thick so I ended up using a lot of extra water. Even my meat eating boyfriend loved this, so that how I know it’s REALLY good. Thanks so much for the fantastic recipe ! These burgers are absolutely awesome. My only recommendations would be to make a bigger batch of burgers (so there are leftovers for lunches) and to make a lot more of the peanut sauce. We served the burgers on toasted Turkish bread with the peanut sauce, tomatoes, red onion, avocado slices and mixed greens. Everyone rated them at least 9/10 – a score that is hard to beat in our household. We only started trying to eat vegetarian (and mostly vegan) a few months ago. Before that we were rather bored with the thought of cooking. Finding this web site, and a few other vegan recipe blogs, has made us so much more inspired to cook again. It has also got my 12 year old son much more involved choosing recipes and helping in the kitchen. Thanks so much for your fantastic site!! Made them over the weekend. The only modification was egg (I’m not vegan). I really liked them, although I think I’ll leave out the nuts from the burgers next time. I don’t know…not so much a fan of the crunch. I also will just pan fry them next time. I never have success baking these kinds of patties. I find they dry out and don’t hold together really well. Not as healthy on the stove, but I don’t really care! I love that sear they get. Love the peanut sauce too! I made these yesterday for a BBQ with friends in the UK. Even the die-hard meat fanatics were making space on the plates for these! Essential with the peanut sauce which is delicious. The best moment was having the gluten intolerant said meat fanatics saying this was the best *ever* because they could eat everything! Recipe only made six patties so recommend doubling up (thoughts I’d benefit from leftovers!). Don’t shift patties in oven until crisp as they fall apart. Certainly staples from now on! These are lovely! I’m going to make them for a bbq I’m going to at the weekend, and I was wondering if you thought they might stand up to being put on the grill? Great flavor, but really crumbly. Help? I made these for my sisters birthday dinner yesterday- they were FANTASTIC! I used some of the leftover sauce on noodles today, with some sliced spring onions scattered on top- yummy. Made these burgers today – delicious! I didn’t have the ingredients for the peanut sauce so I ate them wrapped in Chinese leaf with some spicy tomato relish. Yum! As I had some oat bran and oat flower in the cupboard I used 2/3 cup and 1/3 cup respectively instead of the oat flakes. I didn’t have any problems with the patties falling apart. I’d like to see comments from someone (besides Angela :-) who has actually MADE these. Sure, they look and sound delish – they do! – but how did it work when you tried it at home?? Never mind – I see some have popped up! (Where did they come from? I thought I’d scrolled all the way …. ) These will be useful, and I AM going to try them very soon! I love most all of the recipes I’ve found on your page Angela. Planning to use this recipe for a New Years meal, these burgers sound amazing. I already made a batch of the sauce and we’ve eaten it as salad dressing and dip for steamed vegetables. Thanks so much for your blog. This burger is awesome. I am new to vegan food and I am amazed how easy it is to prepare. I can only recommend this!!! Uh-maZING! Soooo good! We actually had this with your Tropical Mango, Banana & Pineapple Kale Salad which was a hit! The peanut sauce… I could eat it by the barrel! I just made this recipe last night. As an avid Vietnamese and Thai cook I loved the idea of making a Thai veggie burger – and the sweet potato is such a nice addition to this burger. I baked most of my burgers, following the recipe, but I also decided to try and pan fry a few just to compare texture and final results ( cooking them like I do my falafel burgers). I found that the oven baked burgers were a bit dry and lacked flavor but the burgers that I pan fried were amazingly moist and much more flavorful. I wasn’t sure if pan frying them would allow the sweet potato enough time to cook but the result was really wonderful. I do like the idea of baking the burgers – it’s healthier and easier to cook them all at once – but I am wondering if there is a way to add more moisture to the burgers. True confessions??? I’m eating one raw! SO delicious! Can these be made on the grill? Hi Darlynn, I’m sorry I haven’t tried it out before so I can’t say for sure. If memory serves me correct, these burgers are a bit more delicate than my Favourite Veggie Burger recipe. I would suggest trying out that one on the grill first! I generally like to “pre-bake” veggie burgers in the oven for 15 to 20 minutes, and then finish them off on the grill. Burger wedding reception? That sounds amazing! *heart eyes* Congrats, Amy! I don’t get it. Why are all the comments on this site about how amazing everything “looks”? Is anyone actually cooking this stuff? I’m trying to go vegan and I’m looking for meal ideas. So far I’ve found that there does not seem to be a positive causal relationship between effort (not to mention number of ingredients) and taste. Could it be that all you people who comment on the photos figured this out long ago and aren’t really bothering to try these recipes? Hey Danielle, Congrats on all the changes you’re making! My best advice is to start slow so you don’t overwhelm yourself. It’s hard to get others on board if they aren’t ready, but I just kept offering my husband the plant-based dishes over and over, and with time, he became a huge fan of them. Years later, there isn’t anything he won’t eat (and he used to be super picky). It can take time, for sure, so I tried to focus on the changes I was making for myself and how I felt. Great sources of protein are lentils, chickpeas or other beans, nuts, seeds like hemp hearts, tofu/edamame, etc. I hope this helps and happy cooking! Oh…… also, I’ve never gone meat and egg free. How do I get enough protein and what are the best sources of vegan protein? Hey! Made these on recommendation from Tammy Hembrow and they’re delicious!! I know that this is a vegan based recipe but would a substitute for the flax egg be just a normal egg would it be the same consistency and would it taste the same ? Hey Chiara, It might work, but I’m not sure as I haven’t tried that in any of my veggie burgers before. If you decide to experiment, please let us know how it goes! I’m so excited to try this recipe! I just made another bean burger recipe which, unfortunately, broke my food processor. :( So, alas, I need to buy another food processor ASAP! If I omit the sesame oil for dietary reasons and add sesame seeds for flavor…would that make it too dry? Could I add a little mashed avocado to moisten it up a bit? Hey Michelle, Oh I’m sorry to hear about the food processor. Mine broke recently and it’s a very sad thing to happen! lol. I haven’t tried this recipe without the oil, so I’m not too sure. But I definitely think you’d want to replace the moisture by at least adding the same amount of water. If you try anything please let us know how it goes! I’M OBSESSED! I’ve made this twice and peanut sauce several times for coworkers. While the prep work is a little more than I usually tolerate, it is well worth it! SO much flavor and it’s incredibly healthy. I actually serve the patties with the sauce and some quinoa and veggie mix from Trader Joes and it’s perfect. I’ve tried the salad and it’s great, I just like to mix it up. Can’t wait to try many more recipes. I love this recipe. Would it work to substitute carrot for sweet potato in your veggie burger recipes? These were a hit! Even with my 16 year old stepdaughter who is a picky eater and has no interest in being vegan. As a previous reviewer said, a little more prep work than I normally put in, but I am so glad I gave them a shot. I will be making them again! These burgers are AMAZING. I put together a bowl with jasmine rice, lactino kale and shaved carrots massaged with olive oil and lime, the roasted sweet potatoes, and the burger all dressed with the peanut sauce and it is better than I ever could have imagined. Thank you! Your bowl idea sounds delicious!! I can’t wait to try that out. Thanks for sharing! Hi Emily, Oh interesting question, so you’d like to swap out the beans entirely? I have never tried this before so Im not sure…ground walnuts would be delicious for sure you just may need more binding ingredients so they hold.